Because of the delay in construction of entrances to the new school due to discovery of a high pressure gas line next to the school site, visitors on July 24 will have to approach and leave the school in a roundabout way. Cars must turn off Hog Mountain Road onto the existing Osborne Road, then turn onto V.M. Osborne Road to find the entrance to the School at Dewey Road just south of Hog Mountain Road. 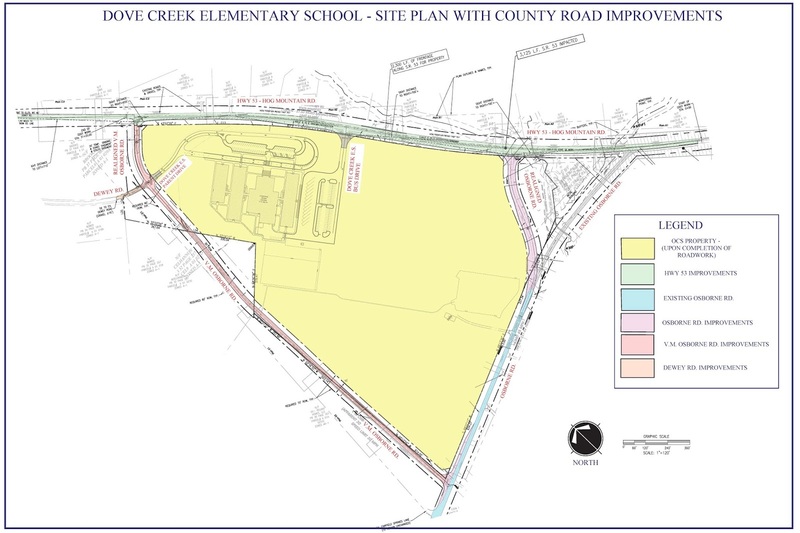 The planned entrances to the new school off Hog Mountain Road are not scheduled to be completed until the end of October, according Emil Beshara, director of the Oconee County Public Works Department. Tours of the new building will follow the ribbon cutting ceremony on the 24th. The Oconee County Board of Commissioners, in a called meeting on June 12, agreed to spend an additional $322,481 for the labor costs of relocating the high pressure gas line at the construction site for the entrances to the new school. The Board also approved an intergovernmental agreement with the City of Winder, owner of the gas line, in which Winder agreed to pay for the materials needed for the pipeline relocation. The additional pipeline cost brings to $2,924,931 the amount the county is spending on the road work for the two school entrances. The Board had voted in March to spend $2,573,673 for construction of the road modifications for the school’s entrances, and in May, the Board approved spending $28,777 for additional right of way for project. 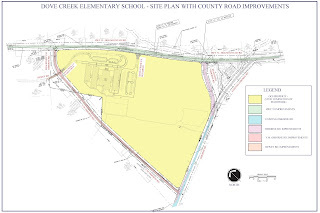 In early 2017, the Board of Education purchased four parcels on Hog Mountain Road between Osborne Road and Dewey Road northwest of U.S. 78 for the Dove Creek Elementary School and a future middle school. Cost of the properties was $1,057,643, including a brokerage fee of $7,500 to Thomas Little of Southern Land Exchange on Daniells Bridge Road, according to Anisa Sullivan Jimenez, director of Communications for Oconee County Schools. In addition, the School System spent $13,153,000 for construction of the school and expects to spend an additional $807,650 in architectural fees, surveying and site testing, according to Jimenez. The site is to have two entrances, one off Hog Mountain Road for buses and the other off V.M. Osborne Road for parents. School Superintendent Jason Branch told the Board of Education earlier this year that the School System became aware of problem the gas pipeline created for construction of those entrances only in December of last year. The only portion of the entrance project that will be paved and ready for traffic by August 1 is V.M. Osborne Road from Osborne Road to the car entrance at Dewey Road, Beshara told me in a pair of email exchanges on Wednesday. Buses will use a temporary entrance off Hog Mountain Road that is graveled but not paved, Beshara said. V.M. Osborne Road will not be connected to Hog Mountain Road at that point, Beshara said. All incoming traffic to the school and leaving the school will need to use V.M. Osborne Road off Osborne Road. Cars leaving the school will need to travel V.M. Osborne Road to Osborne Road and then connect back to Hog Mountain Road. When the road work is completed, cars will be able to exit the school by turning right on V.M. Osborne Road to Hog Mountain Road, where they can turn left or right, but entrance to the school by cars will be possible only by using both Osborne Road and V.M. Osborne Road. “We do not want any through traffic on Dewey Road,” Beshara wrote. The realignment of Osborne Road with Hog Mountain Road also will be incomplete when school starts, Beshara said. The Georgia Department of Transportation has said “those aspects of the project cannot begin until the gas line is relocated,” Beshara wrote. Hog Mountain Road is a state highway. Beshara said he expects the gas pipeline relocation to be completed by Aug. 10. While the timetable could change, Beshara said he believes the entire project should be completed by the end of October. Note: This story has been updated at 10:25 a.m. on 7/16/2018 to clarify the details of the auto entrance and exit from the school. The initial story said that entrance and exit is off Hog Mountain Road, but it is off V.M. Osborne Road a short distance from Hog Mountain Road. I apologize for the error and thank Public Works Director Beshara for pointing it out to me. The post has been modified at 9:45 p.m. on 7/16/2018 to indicate that the total cost of the purchase of the land for the school did include the brokerage fee. The information I received initially reported the brokerage fee separately. Maybe next time OCS endeavors to build a school, they will do their due diligence to discover existing infrastructure that may pose problems. Are all these entrances and exits as convoluted as they sound? So the BOC had to spend twice as much on the roads and access to the property as the BOE spent on the actual land. An extra third of a million dollars laid on the Oconee County taxpayers because of the sudden discovery of a high-pressure gas line. How nice the BOE voted to spend the money. Our money, by the way. Not theirs. Why the first penny of taxpayers' dollars is used to pay for the error in which the money spigot had not one shred of responsibility. You can't make this stuff up, except within the annals of "governance." Check out what Mark Twain said about school boards.